Arrival at Guwahati drive to city and check into your hotel room. Overnight stay at Guwahati. Morning after breakfast Guwahati sightseeing including Morning after breakfast visit Kamakhya temple,Purva Tirupati Shri Balaji temple,Uma Nanda Temple. Later transfer to Tejpur road surface approx 185Kms/3Hrs. On arrival Visit to Madan Kamdev, Chitralekha Udyan & Mahabhairav Temple. Check in at hotel and over night stay at hotel in Tejpur. Morning after breakfast proceed to Dirang.It would be take 7Hrs to travel road distance approx 200Kms. Enjoy the picturesque surroundings of Nameri Forest and Jiabhorali/Kameng river, one of the bio-diversity hot spots. Visit Tippi Orchid Centre en-route. On arrival check in at hotel over night stay at hotel in Dirang. Morning after breakfast drive to Tawang road surface approx 130Kms/4Hrs 30Min. Enjoy the magnificent landscape of the Himalayas drive through the Sela Pass and visit to Jaswantgarh, Nuarang falls, War cemetry- places associated with Indo-China war on 1962. Check inn hotel. Over night stay at hotel in Tawang. Morning after breakfast transfer to Bomdila road surface approx 180Kms/7Hrs.On arrival check in at hotel.Over night stay at hotel in Bomdilla. Morning after breakfast proceed to Kajiranga road surface approx 200Kms it would be take 8hrs.On arrival check in at hotel.Over night stay at hotel in kajiranga. 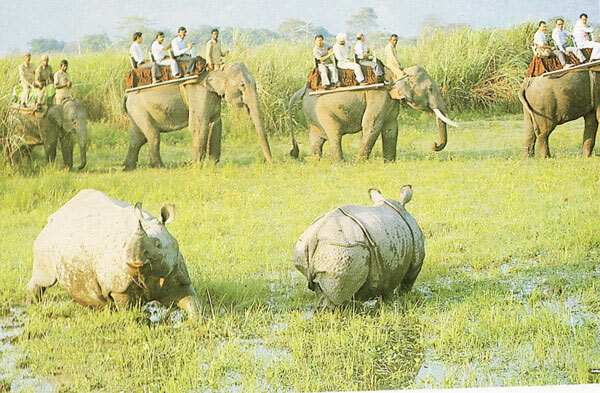 Early morning (5:30 am) explore central Range of Kaziranga National Park on Elephant Safari. On return explore the eastern range on a jeep safari. Return for lunch and proceed to Western Range of Kaziranga National Park on jeep. Stay overnight at hotel in Kaziranga. Early morning 5:30Am will do elephant safari.After safari transfer to Guwahati road surface approx 220Kms/6 Hrs. Afternoon return to Guwahati. Evening visit local market called Fancy Market.Over night stay at hotel in Guwahati. 06th May Guwahati Drop at Airport/Railway station. Rates are valid for INDIAN NATIONALSonly. Guide charges, Entry Fees & Camera Charges if any. VIP Darshan in Kamakhya Temple. Any cost arising due to natural calamities like cyclone, road blockage, political disturbances (strikes), etc (to be borne by the client and directly payable on the spot).